The U.K.'s second quarter GDP declined .7% compared to the first quarter. This is a preliminary estimate. Gross Domestic Product: Preliminary Estimate, Q2 2012 WSJ.com That decline, consistent with recessionary conditions, was higher than the .2% estimate. Investors seem heartened by the steady flood of negative news, believing that such a steady drumbeat will spur the Federal Reserve into another round of quantitative easing. The WSJ published a story that claimed the Fed was "closer" to taking further steps. The stock market has reacted positively to the initiation of the first two rounds of quantitative easing. While QE3 could spur a market rally in stocks, bonds, gold, other commodities, it could easily make the basic problems worse. A key negative factor involves the impact of lower interest rates on spending by the Saving Class, who have lost any meaningful income generation from their savings parked in bank CDs, treasury bills, and money market funds. As a result, those folks, many of whom are retired, have cut back on their spending. I would just highlight that the U.S. economy is already sluggish with the average 30 year mortgage rate now at 3.53%. Primary Mortgage Market Survey (PMMS) - Freddie Mac The ten year treasury note is currently hovering near 1.4%, Chart, and the five year note is around .55%, Chart. The extended period of abnormally low rates will have a long term beneficial impact on debtors. Corporations have refinanced long term debt at much lower rates, and those savings will flow to their bottom lines for years to come. The same is true for individuals that have been able to refinance mortgages. I would submit that most of that long term benefit to debtors has already been captured, while the abnormally low rates will continue to cause a GDP drag through lower spending by the large Saving Class. The Real Cost of The Federal Reserve's Jihad against the Saver Class In addition, the abnormally low rates have had and will continue to have major adverse impacts on pension plans and their funding. A SmartMoney columnist, Jack Hough, wrote an article recommending REITs, which was published in the WSJ last October. He updated that column in a recent article, WSJ, arguing that REIT investors need to be more cautious now. Since his 10/11 article, the MSCI U.S. REIT index has increased by 30%, excluding dividends, compared to S & P's 22% gain. He points to a higher yielding REIT, KBW Premium Yield Equity REIT Portfolio (KBWY), an offering from Powershares that currently has over a 5% dividend yield. He also mentions a much broader REIT ETF that is currently yielding close to 3.3%. Vanguard - REIT ETF - Overview I do not currently own a REIT ETF. I would prefer buying one before the index rises 30%. Of the individual issues mentioned by him, I have bought and sold Duke Realty (DRE), and I may reestablish that position in an IRA at some point after selling out at $15.3 (May 2011). I will buy individual REITS and currently own small positions in CWH, GOV, BDN, MPW, SIR and a new REIT added yesterday in the Roth IRA which I hope to discuss in next Monday's post. Health Management (own as LT) reported second quarter GAAP net income of 14 cents per share, adjusted to 21 cents excluding items, one cent better than the consensus estimate. The Lottery Ticket LSI reported non-GAAP E.P.S. of 21 cents per share and predicted third quarter non-GAAP in the range of $.14 to $.2. Revenues were $659+M. The consensus estimates were for 17 cents in the second quarter and 18 cents in the current quarter. LSI Analyst Estimates The company ended the second quarter with $601.1M in cash and cash equivalents. Zions Bancorporation (own preferred stock) reported adjusted net income of 40 cents per share, six cents better than the consensus estimate. 1. FFBC (own: Regional Bank Basket Strategy): First Financial Bancorp reported second quarter net income of $17.8 million or 30 cents per share, up from 27 cents per share in the 2011 second quarter. As noted in the press release, this bank has been paying its net income per share in dividends. The next dividend payment will be 30 cents per share ($.15 fixed and $.15 variable). I am reinvesting the dividend. The consensus estimate was for 30 cents. Return on average assets for the quarter was 1.13%. Net interest margin was good, comparatively speaking, at 4.49%. The coverage ratio for NPLs was 59.82% (prefer over 100%) and NPLs to total loans were high for stocks in this basket at 2.76%. 2. CBU (own: Regional Bank Basket Strategy): Community Bank System reported second quarter net income of $21.1 million or 53 cents per share, up from 49 cents a share in the 2011 second quarter. The consensus estimate was for 50 cents. As of 6/30/12, the net interest margin was 3.96%; the efficiency ratio was at 56.1%; the tangible equity to tangible assets ratio was 8.09%; the Tier 1 leverage ratio was 8.98%; NPAs to total assets were excellent at .4%; the coverage ratio was 161%; and the return on average assets for the quarter was 1.2%. I liked this report considering the challenges faced by banks in the current low interest rate environment and increased federal regulations. Community Bank System rose 32 cents in trading yesterday to close at $26.86. 3. MBVT (own: Regional Bank Basket Strategy): Merchants Bancshares reported second quarter net income of $3.74 million or 60 cents per share, up from 58 cents in the year ago quarter. The Board declared the regular 28 cent per share quarterly dividend, with a 7/31/12 ex dividend date. 4. FMER (own: Regional Bank Basket Strategy): FirstMerit reported second quarter net income of $30.6 million or 28 cents per share, up from 27 cents in the 2011 second quarter. The consensus estimate was for 28 cents. FirstMerit closed yesterday at $16.17, unchanged for the day. The dividend yield at that price is slightly under 4% according to Marketwatch. 5. STL (own: Regional Bank Basket Strategy & own 200 of the TP STLPRA): Sterling Bancorp reported second quarter net income of $4.9 million or 16 cents per share, up from 8 cents in the year ago quarter. The consensus estimate was for 15 cents per share. As of 6/30/12, the net interest margin was 4.04%; and NPAs to total assets were excellent at .28%, the coverage ratio was 377%. Currently, my only significant concern about STLPRA is the possibility that Sterling will elect to redeem it. Par value is $10. I have bought and sold the TP on many occasions and currently own 200 shares in the ROTH IRA. 6. Redemption Proceeds Received Yesterday for Three BAC Trust Preferred Securities: Three separate Bank of America Trust Preferred securities were redeemed from my accounts yesterday. Two were 50 share lots in the $25 par value exchange traded TPs KRBPRD and KRBPRE. The KRBPRD shares were purchased in October 2010. I also lost one $1,000 par value TP that was purchased last October. 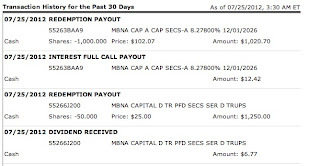 All of the foregoing were originally issued by MBNA Capital and became BAC obligations it acquired MBNA. I made a small profit on the $1,000 par value bond, and was close to broke-even on the exchange traded bonds. The problem with these redemption is the lack of income alternatives for reinvestment. All of the foregoing securities were yielding over 8% at my cost. 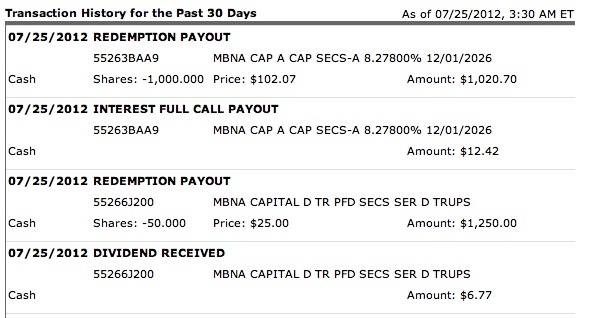 I will add the snapshot showing the redemption of KRBPRE out of the ROTH IRA later today. Vanguard is a day behind Fidelity in making those kind of entries. 7. Bought Back Terex at $14.425 Yesterday (Lottery Ticket Basket Strategy)(see Disclaimer): I knew that Terex was going to report earnings after the close yesterday. The consensus estimate was for $.49 on $2.05 billion in revenues. Before the release of this report, the consensus estimate for 2012 was at $1.76 and $2.71 in 2013. The stock seemed cheap to me at about 5.32 times estimated 2013 earnings. Another reason for buying it was the positive report issued earlier this week by Caterpillar. The shares continued to slide after my purchase yesterday and closed at $14.11. Total Realized Gains TEX Shares: $293.36 What do you expect with 30 share flips? It looks good to the OG who never frets about such purchases. The prior gains allow me to buy up to $593.36 of Terex stock. It would be a understatement to say that our LB is a stickler about its rules. I sold the LT Dole to make room for Terex. Another rule now applicable to LT buys is the total amount invested can not exceed the total realized gains for this strategy. Most of those rules deal with risk management. One way to control risk is by the amount of the investment. Another way, among many, is to avoid buying an entire position all at once when the market is in an Unstable Vix Pattern, as now. Terex announced after the close yesterday better than expected results. Income from continuing operations was reported at $83.6 million or $.75 per share on net sales of $2,011.5 billion. The company ended the quarter with $841.5 million in cash and cash equivalents. The company raised guidance for 2012 to $1.95 to $2.05.